Foam-Sclerotherapy is a very old fashioned way to treat varicose veins which has recently become more popular. In clinical trials it has been found that foam sclerotherapy treatment can be as effective as stripping surgery. We do not offer foam as a first line-treatment for varicose veins as laser and radiofrequency are far superior both in terms of results and complications. However we do offer foam as an adjunct to other therapies and sometimes as a first-line in very carefully selected patients. In this treatment the medication is mixed with air to form a suspension of micro-bubbles. The resulting foam is injected into the vein either directly or under ultrasound guidance. Because foam has a greater surface area than liquid, it is able to stick to the vein walls more effectively and cause faster "shrinkage" of the damaged veins. 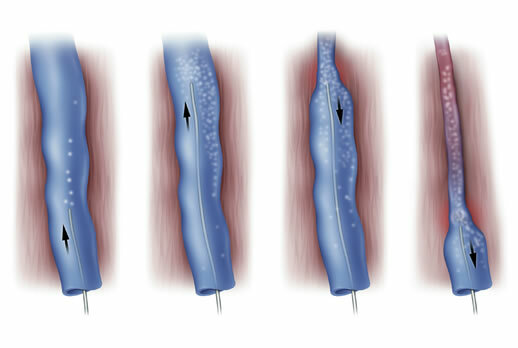 A needle is inserted into the main affected superficial vein, usually under ultrasound guidance. Sclerosant foam is then injected and monitored using ultrasound. Once the foam has filled the main superficial vein, the upper end of the vein may be compressed to prevent entry of foam into the deeper veins. The foam causes inflammation of the vein wall, obliteration of the veins lumen and vein occlusion. Further injections may be given during the same or different sessions to make sure that all the varicose veins have been completely filled. Compression stockings are normally worn for between a week and a month after the procedure.